In this month’s letter, ADEA Executive Director Dr. Rick Valachovic reflects on our Association’s accomplishments over the past 90 years and credits our tradition of coming together to frankly assess and improve the state of our enterprise. In some ways, 90 years makes a world of difference. In others, not so much. A year after our Association was formed in 1923, our predecessors got together in Chicago for their first annual session. If you are not already aware of it, you should know that our Association, then called the American Association of Dental Schools (AADS), came into being on the cusp of a momentous transformation. Despite the existence of many exemplary schools of dentistry at the time, the educational sphere was poorly regulated, often profit-driven, and characterized by uneven quality. Yet by the end of that decade, those problems were largely resolved, with dental education firmly established as a university-based scholarly endeavor. In 1920, the Carnegie Foundation for the Advancement of Teaching commissioned Dr. William J. Gies to conduct a groundbreaking study that would lay the cornerstone for dental education as we know it today. 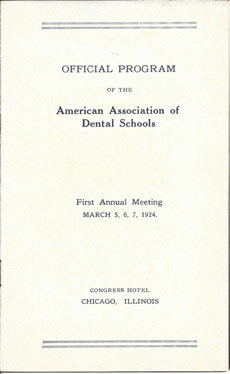 Dr. Gies presented a preliminary version of his report to the 40 AADS members who attended the Chicago meeting, requesting that they discuss it “freely, frankly and critically.” He went on to state that he would not reply to their criticisms in order to facilitate “expression of direct dissent on every item on which it might be suitably recorded.” After the discussion, Dr. Gies stated that he was both “greatly and gratefully disappointed” that the paper had been so “cordially and magnanimously” received. I had the pleasure of rereading those proceedings this past month, and it is astonishing how many of the core concerns that motivated Dr. Gies’s recommendations for the reform of dental education are still with us today. True, university-based dental education is now universal in the United States and Canada, but in other respects, we continue to wrestle with some of the same challenges and still embrace many of the values that were on exhibit at that meeting in 1924. Dr. Gies and his colleagues posed many questions that will likely be uttered again at this year’s ADEA Annual Session & Exhibition. Is the dental profession large enough to serve the public adequately? Are new members of the oral health team needed to extend access to care? What is the proper relationship of dentistry to medicine, and is there room for common curricula? How can dental educators cooperate with accrediting and examination bodies to elevate standards within the profession? Where does the dental school fit within the university structure? One of the most intriguing items in the minutes from that 1924 meeting was raised by then President Dr. Henry L. Banzhaf. He urged cooperation between medical and dental colleges and cited an example—at his home school, Marquette University—of interprofessional care that bears a striking resemblance to the collaboration currently taking place between nursing and dentistry at New York University. In sharing these similarities with you, I don’t mean to imply that we haven’t made progress in the last 90 years. Quite the contrary. I have been a witness to the unfolding of much of our rich history since joining AADS in 1982. I got a closer view when I was elected to the Council of Faculties that year, and I acquired a front row seat when I became Executive Director in 1997. Part of my keenness to take on this new role stemmed from my awareness that many in our Association were ready for a change. They were eager to see AADS expand beyond its role as a guardian of dental education and become more actively engaged in shaping its future. When I think back to those days, three individuals stand out for their unwavering commitment to seeing our Association fulfill its potential. Last month, I gave each of them a call to reminisce a bit as this anniversary approached. You won’t be surprised to learn that one of the people on the other end of the line was Dr. Art Dugoni, Dean Emeritus at the School of Dentistry that bears his name at the University of the Pacific. Our conversation ranged all over the map, touching on the many ways ADEA had evolved over the years, improving internally to better serve its members and influencing external audiences to improve the public’s oral health and enhance dental education. Of all the things Art mentioned, what stood out most was the conscious effort of our Association to bring the education and practice communities together. As I hope you know, our relationship with the ADA today is both cordial and collaborative. Our work with the Commission on Dental Accreditation (CODA) on the new standards for predoctoral dental education programs is a testament to how far we have come since our Association was first founded. We also benefit from this strong relationship in a myriad of smaller ways, such as gaining access to the live ADA Education in the Round courses webcast each year from the ADA’s annual meeting. As those of you who have been around for a while know all too well, together, these collaborations represent a major step forward for dental education, which often found itself isolated in the past. Dr. Dom DePaola, Associate Dean for Academic Affairs at Nova Southeastern University College of Dental Medicine, reminded me of conversations we had about this problem shortly after I became Executive Director. When he was President and Dean of Baylor College of Dentistry in the 1990s, he used to attend the meetings of the American Council on Education (ACE) and the Association of American Medical Colleges (AAMC). “I never saw anyone from the dental profession there,” Dom told me. “I felt like the lone wolf.” Dom’s concerns dovetailed with my own, and I was delighted to find a fellow ADEA member who was as committed to the relentless pursuit of strategic partnerships as I was. Today, this perspective is widely embraced throughout our Association, and the results are apparent. I am now a member of the Washington Higher Education Secretariat. Our relationship with the AAMC has borne copious fruit, most notably MedEdPORTAL®, our joint repository for free, online, peer-reviewed medical and oral health teaching materials. ADEA, AAMC, and several other health professions education associations also have come together in recent years to define competencies for interprofessional practice and education and to promote their use. This initiative, the Interprofessional Education Collaborative (IPEC), which continues to gain momentum, thanks in large part to the energy and insights of ADEA members, will likely have a transformative impact on the delivery of health care. These developments are part of a larger mission, articulated by our predecessors in 1924, to fully integrate dentistry in the health care system. As Dom points out, dentists are in a great position to shepherd patients into the health care system, but doing so means we need relationships with the whole panoply of health professionals: primary care providers, behavioral health specialists, social workers, you name it. We have a ways to go in making this vision a reality, but we are much closer than we were a decade ago. In the meantime, ADEA can take pride in its work in another vital area: promoting curricular change through the ADEA Commission on Change and Innovation in Dental Education (ADEA CCI). 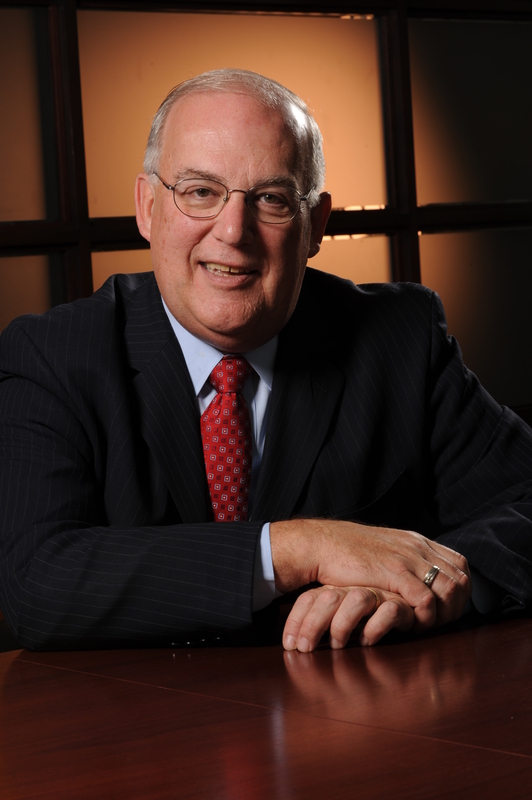 “I think CCI is really setting the stage for faculty within dental schools to do things differently,” said Dr. Ken Kalkwarf, former Dean of the University of Texas Health Science Center at San Antonio Dental School, where he currently serves as President ad interim. Ken took on the enormous challenge of getting ADEA CCI up and running when it was first founded in 2005. In just a few short years, this initiative has prompted our member schools and programs to think long and hard about their responsibilities in educating tomorrow’s practitioners. While our institutions are at different stages in responding to these questions, I agree with Ken that this member-driven initiative has fundamentally changed the philosophy guiding dental education and is now having a major impact on how we examine our students for licensure. We are preparing our students not only for a continually changing health care environment, but also for shifts in the economic, demographic, and scientific landscapes. There are far too many additional milestones in our collective history for me to summarize here today. Fortunately, we have begun a timeline of contextual milestones in dental education that you can view on our website. Our plan is to expand it over the next decade in anticipation of our Association’s 100th anniversary, and we want you to be a part of that process. Shortly, ADEA member institutions, individuals, and programs will be able to contribute documents and images that chronicle our collective past. We hope that by 2023 our community will have created a comprehensive picture of dental education’s evolution since its beginnings. We use different words—health system reform, evidence-based practice, patient-centered care, serving the underserved—to describe what we are striving for today, but in the end, it comes down to the same thing. Every year, and throughout the year, we come together to air our differences, seek common ground, and chart a path forward. Together—with each other and with our allies on a multitude of fronts—we have accomplished so much more than our predecessors could have imagined. I look forward to joining with many of you to carry on this tradition in the days and years ahead. Congratulations, this is great news in the field of dentistry. This is a great article and very informative on how the dental industry is evolving and only getting better. I found Ken’s statement “Is our responsibility foremost to train people technically for practice today, or is it foremost to teach them to be critical thinkers, lifelong learners, individuals who are capable of working within different environments with new information, and continuing to move oral health care forward?” to be very intriguing. I think this statement relates not only to the dental professional but also for the end consumers who are seeking care and continued education on the issues they are facing. I came across an informative dental information center (http://www.dentalplans.com/dental-information) on dentalplans.com and it seem’s that they are trying to push the envelop on educating the dental consumer. I feel with more programs like this, both on-line and off-line dental education will grow both from a consumer standpoint as well as for those interested in the dental profession.